The Archdiocese of Philadelphia is auctioning off one low mileage car, in mint condition, used slightly by one owner. 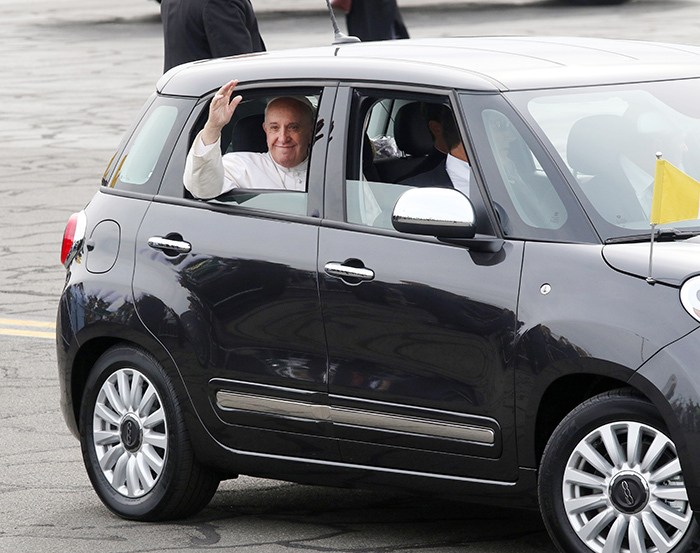 Two of the gray, four-door Fiat 500 L sedans that were used to shuttle Pope Francis around the Philadelphia area during his visit to the city last year will be available for public viewing and will be auctioned off this month at the Philadelphia Auto Show, running Jan. 30 to Feb. 7 at the Pennsylvania Convention Center. Proceeds from the auction will benefit ministries of the archdiocese, with 50 percent directed toward the annual Catholic Charities Appeal, and one-third each to Casa del Carmen social service agency in North Philadelphia, Mercy Hospice for homeless women and children in the city and the archdiocese’s schools of special education. Speakers at a press conference at the convention center Jan. 20 hoped the symbolism of the simple car used by the humble pope may make it an attractive item for a car collector. Millions saw the pope through the windows of the car as he was driven to and from Philadelphia International Airport, St. Charles Borromeo Seminary and center city during his Sept. 26-27 visit. 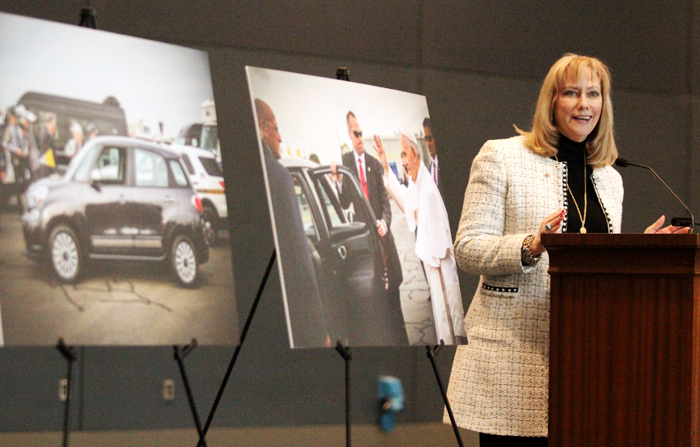 Chrysler Fiat provided two of the cars for the Philadelphia leg of his apostolic visit to the United States, and the company recently reached out to the Philadelphia Archdiocese to donate them back, said Donna Crilley Farrell, executive director of the World Meeting of Families in Philadelphia. Calling the cars “an icon of the papal visit,” Farrell recounted what for her was still an emotional moment, even four months later. After Pope Francis’s plane landed in Philadelphia and he was about to depart for center city and a Saturday morning Mass, he ordered his Fiat to stop, and stepping out on the tarmac, he walked over to kiss and bless a boy with cerebral palsy. The Catholic Charities Appeal will launch its annual fundraising activities in parishes across the archdiocese early next month. The appeal benefits numerous social outreach efforts of the church to people in need regardless of creed or background. Mercy Hospice, located at 334 South 13th Street in center city Philadelphia, offers a safe, warm shelter for up to 31 women and children at one time – 230 women and 41 children were assisted last year – plus a hot meal, clothing, life-skills training and a day program for women who may have housing but need extra help. Casa del Carmen, an agency of archdiocesan Catholic Social Services, serves low-income and primarily Hispanic residents in the Hunting Park and Feltonville areas of North Philadelphia. Car buffs will have the chance to bid at a public auction for one of the cars – the other car may be auctioned later – the night before the car show opens with 700 vehicles on display. The auction starts at 8:45 p.m. on Friday, Jan. 29 at the Black Tie Tailgate event at the convention center. The auction will accept bids from visitors to the event and online as video will be streamed live on the Internet, according to Max Spann Jr., president of the firm running the auction. His company has in recent years run auctions for several archdiocesan properties that were sold to benefit the church’s needs. The Black Tie Tailgate itself is a fundraiser for Children’s Hospital of Philadelphia, raising $6.3 million since it began in 1986. Tickets start at $225. The Philadelphia Auto Show, now in its 115th year, also benefits Philadelphia charities by donating $2 from each $14 per adult ticket sale. None of the officials involved with the auction speculated on how much money they hoped to raise from the sale of the Fiat used by Pope Francis.